Impromptu protests erupted in various parts of the city with calls for a state shutdown due to the police’s inability to contain violence in Pune which later spread to other parts. Mumbai: For Shridhar Jadhav, a 26-year-old dentist from Panvel in Navi Mumbai, his visit to Bhima Koregaon on January 1 was a routine one. He and his wife Alka, also a dentist, had travelled to Pune in the wee hours hoping to pay an early homage to the martys of Mahar regiment and then return to Mumbai by evening. But just a few kilometres past Pune, their car was stone- pelted, the windscreen damaged and the panchsheel (Buddhist) flags were plucked and stamped over. “These men had come in a bunch of 20-25. They seem to be well versed with the locality and also our vehicles were easy to identify with Ambedkar’s picture on it. We were lucky to have escaped unharmed,” Jadhav said today from Mumbai. He had to return to Mumbai mid-way without visiting the Bhima Koregaon memorial. Today, when they read the newspapers in the morning and received a few messages on WhatsApp about impromptu protests at different places in the city, they decided to head to Chembur’s Sidharth colony, where the couple has a few “Ambedkarite friends”. 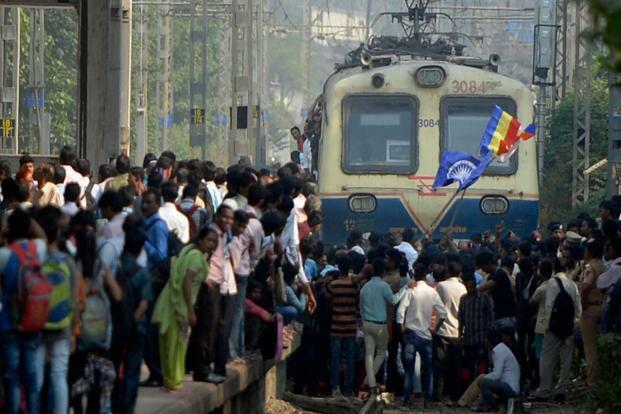 Like them, several groups – big and small – had gathered in various parts of Mumbai, especially the eastern region, where the presence of Dalit youth activism is quite prominent. These protests were mostly organic, organised after impromptu messages were circulated on WhatsApp, Facebook and Twitter asking to come together and agitate against the attacks on Ambedkarites visiting Bhima Koregaon. Yashwant Kamal, a young PhD scholar from Tata Institute of Social Sciences, had joined the protest rally that began from Amar Mahal to Sidharth Nagar colony in Chembur. “It was a peaceful rally. People have been protesting in smaller groups across the city,” he said. Most people expressed outrage over the way Bahujan visitors were treated at Bhima Koregaon. “It was a struggle of great odds. It was the 200th year of our historical struggle, where 500 odd Mahar men had felled the Brahmin Peshwa regime. Dalit Bahujan and anti-caste activists have for decades observed January 1 as ‘Vijay Diwas’ to commemorate the defeat of the Brahmin Peshwa soldiers by a Mahar Battalion of British East India Company comprising Dalits in 1818. “These annual gatherings are symbolic and a reminder our ancestors’ struggles. People ought to visit the memorial,” said Sidharth Kamble, a participant at the protests in Khanamwar Nagar at Vikroli. But what pained Kamble was the lack of adequate police bandobast at the site of memorial and across Pune city, where over three lakh people had gathered yesterday. Even over a day since a 27-year-old Rahul Fatangle from Nanded district was killed by caste Hindus at Sanaswadi village, which is near the memorial, over 40 buses ferrying the visitors to Bhima Koregaon, according to Pune police, have been vandalised. But so far, the police have not confirmed any arrests. Union Minister for Social Justice Ramdas Athavale demanded protection for Dalits in the state in the wake of violence at Bhima Koregaon. But in Mumbai, the picture was totally different. Over 100 people, both men and women, agitating against yesterday’s violence were arrested for “vandalising and creating nuisance” on the street. Mumbai police’s spokesperson and deputy commissioner of police Sachin Patil confirmed the arrests across Mumbai. “Miscreants who were involved in vandalising and destroying public properties were detained and later booked under several sections of the Indian Penal Code and Mumbai Police Act,” he told The Wire. The police had issues a list of 20 vehicles that were pelted with stones. Protestors, mainly at eastern express highway, were the ones who were at the site of memorial yesterday and who had to suffer deep anguish on their journey back to Mumbai. Many of them were women and children. Several of them were also rounded up by the police, claimed Yogesh Salve, a resident of Ghatkopar. His sister too was at the protest and she was detained at Vikroli police station at the time of filing this report. Patil too confirmed that protestors were held. “Whoever tried to cause obstruction was arrested,” he said. According to Patil, those arrested are a “mixed crowd”. “We cannot tell who these are and how many men and women have been arrested. Since people have been picked up from various areas, it would be difficult to tell right away the crime and charges they have been picked up for. But most arrests have happened on the eastern express highway, Mulund and Chembur,” Patil said. Some cases of stone pelting, sit-in protests, rasta roko and sloganeering were also reported in parts of Thane district. Even late in the evening, residents of Ramabai colony were engaged in urging people to call the protests off and resume the protest tomorrow, when a call for protests have been given by several Dalit and Left groups. “These impromptu protests do not cause inconvenience to the elite but to the working class. We have been asking people to contain their rage and collectively protest tomorrow,” said a senior activist and journalist from Ramabai colony.